As of November 1, 2010 there will be a price increase for Xbox LIVE Gold subscription in the following countries: Canada, Mexico, United Kingdom or the United States. Amazon.com have a promotion now which let you get 1 year Live Subscription Gold Card for US$39.94 instead of the new price $59.99 from November 1. Under is a table with the prices that are effected. Black Friday is a known shopping day in USA. It’s the friday after Thanksgiving. The shops usually have great deals. But, luckily for you and me. Amazon.com started their Black Friday sale this Monday, November 23. A hole week of shopping and probably good deals. So rembember to check Amazon.com every day. Sometimes I wish I had a bucket loads of money so I could get all the super special editions that do exist on DVD and Blu-ray. 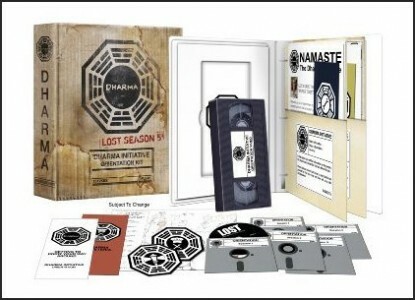 The latest box I want is Lost: The Complete Fifth Season Dharma Initiation Kit on Blu-ray which is out on December 8, 2009 priced at $93.99 on Amazon.com and available for pre-order now. According to HighDefDigest.com it will come on five BD-50 Blu-ray discs with DTS-HD Master Audio 5.1 soundtrack, 1080p video and a bunch of featurettes and deleted scenes. From the picture it looks like you get a VHS too, but no detailed infromation is available as of yet. A cheaper regular Blu-ray version is also available. Here is the best selling games on Play-Asia.com as of Tuesday July 7th, 2009. Here is the best selling games on Amazon.com as of Tuesday July 7th, 2009. Here is the best selling games on Amazon.co.uk as of Tuesday July 7th, 2009. Here is the best selling Blu-ray and DVD on Amazon.co.uk as of Monday July 6th, 2009.